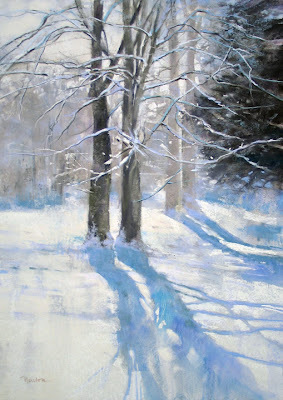 The Christmas tree is down, excess cookies are in the freezer and I'm looking forward to a new year in my studio. Spent the morning working on 2009 taxes but when Fed Ex brought a studio delivery, it was a good time to stop, have a cup of mocha, and share a few favorite things with you. 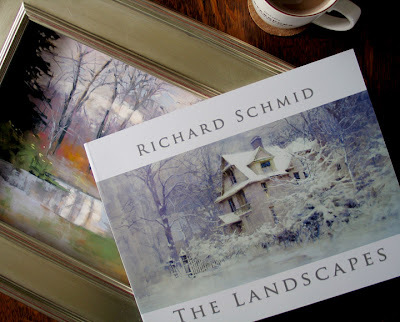 • Richard Schmid's new book, "The Landscapes." By page 43 of 268, I was on visual overload. This is a big book to savor. • Cezanne #72 Champagne Silver Frame, from Art Ready Frames. Beautiful frames at good prices. 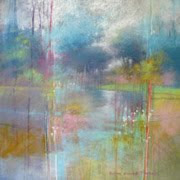 Owner, Linda, is a pleasure to do business with - and she owns one of my paintings! 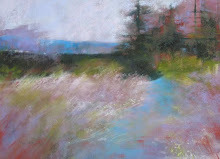 • Clairefontaine Pastelmat paper. 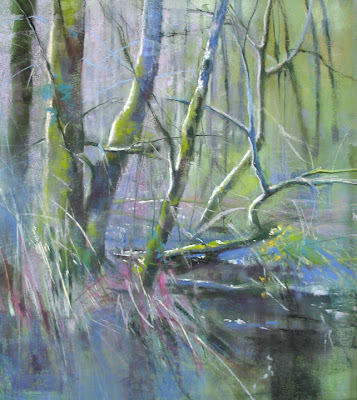 As I spend more time with my first painting on Pastelmat, my appreciation for the surface grows. Areas are simplified - was it because of the paper? 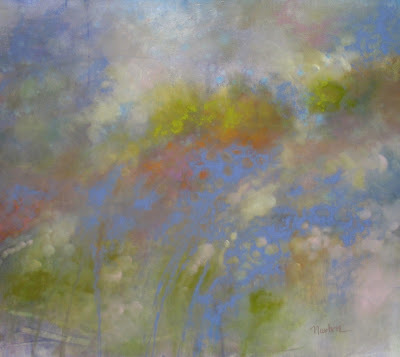 You can order Pastelmat from Dakota Art Pastels. 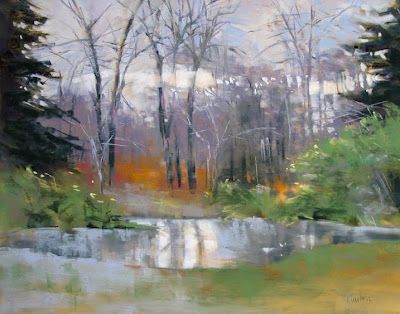 Our pond has appeared in my paintings before but never as a solid - still frozen by our record cold streak. This is my first painting on new Clairefontaine Pastelmat paper. 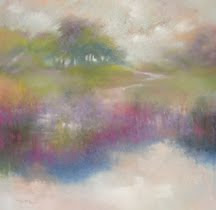 A big reduction in pastel dust. 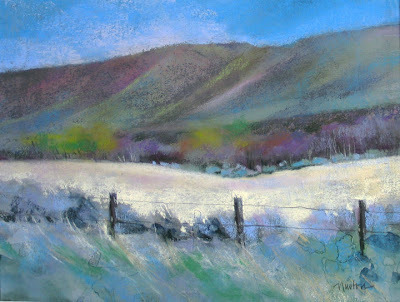 The paper is available from Dakota Art Pastels. Record breaking cold temperatures in the Seattle area. 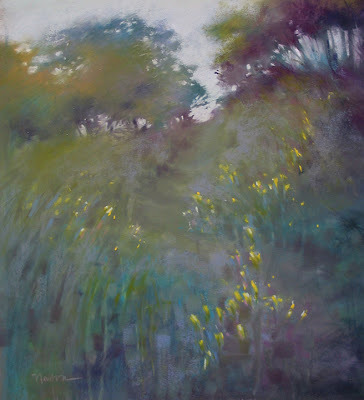 A good time to paint wild iris in bloom. 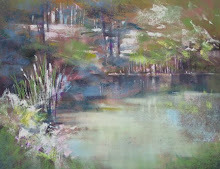 Back to the exciting challenge of non representational art. 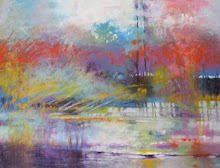 Playing with relationships of color, value, shape, texture, movement. Right brain work. Fun! In between paintings, here's something to do: write a how-to article, as I did about rust, on the How To Do Just About Everything site. Click on the little images to make them bigger. Take a look. Our Washington weather is crispy but no sign of snow at this elevation. The reference photo for "Snowfall" is from a walk to the Post Office in January 2007. This is the end of the Road Show series for now. After looking at hundreds of road trip reference photos, I think it’s a case of “I guess you had to be there.” Very few photos are as interesting as I remember the actual places to be. A fun week of painting though. 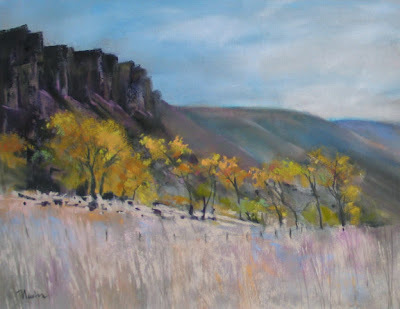 Love the sagey blue roadside brush of early April in Eastern Washington. The lower right corner shows the watercolor foundation making crazy patterns...I like that a lot. Click "Road Show: Eastern Washington" image to enlarge. Second in the Road Show series is Tanglewood Creek. We pulled over and zoomed in to shoot the reference photo for this intimate roadside scene.